The portion, Shmini (On the Eighth Day), deals with the events of the eighth day after the seven days of filling. This is the inauguration day of the tabernacle. Aaron and his sons offer special sacrifices on this day. Moses and Aaron go to bless the people, and finally, the Creator appears to the people of Israel. Aaron’s sons, Nadav and Avihu sin with offering on a foreign fire, and the fire consumes them. Aaron and the remaining sons receive special instructions how to conduct themselves in the situation, and among others orders, they are forbidden to mourn. The portion tells of another misunderstanding between Moses and Aaron and his sons concerning eating the sin offering. The portion ends with the rules concerning forbidden food, detailing the animals, beasts, poultry, and fish that are forbidden to eat. Rules of Tuma’a (impurity) and Taharah (purity) are also briefly explained. The portion mentions many details concerning the tabernacle and offering sacrifices, what is forbidden and what is permitted. How should we understand it internally? We need to examine which of our 613 desires we need to correct, and how. It was said about man, “I have created the evil inclination; I have created for it the Torah as a spice,” so we may correct our evil inclination—the egoistic desires—in which we think only of ourselves and cannot perform a single act of giving and love of others. It is written, “love your neighbor as yourself.” This is a special force, and the Torah was given for the sole purpose of obtaining it. If we study the internality of the Torah properly—namely Kabbalah, the wisdom of light, we draw the light that reforms, which corrects us. The desires in us are called the “evil inclination.” Initially, they are egoistic because “the inclination of a man’s heart is evil from his youth” (Genesis, 8:21). Our goal is to correct it through the study and turn it to the intention to bestow upon others, to the aim to connect and love. By correcting ourselves we obtain the quality of bestowal, equivalence with the Creator and Dvekut (adhesion) with Him in order to be like Him. This is the purpose of man’s creation—to be like the Creator. To correct our desires, our inclination, we must follow a certain order from easy to hard. To properly correct our nature we are required to conduct ourselves according to our development. Like an infant that grows into being a small child, then a youth, and finally an adult, each stage in the development requires more actions and greater complexity. At each stage we draw the light that reforms. It sorts for us by order of difficulty the desires whose time for correction has come. This is why the Torah is called Horaa (instruction), as through it we advance and climb the ladder of degrees through the end of correction of all our desires. In the portion, Shmini, we scrutinize which desires we can correct, how we can correct them, and which desires we cannot correct. Within us are desires that cannot be corrected. They are called the “stony heart.” These desires are the basis of our nature. They are so intense that we cannot even ask for their correction. By correcting what we must, and by regretting not being able to correct the stony heart, as well as by distinguishing what is correctable and what is beyond our ability to correct, we gain a clear perception of the difference between them. By regretting that we cannot correct, yet doing all we can in regard to these desires, they become corrected. This is why the laws of Kedusha (holiness) and Tahara (purity) are called “laws of Kashrut (the noun of the adjective, Kosher).” We scrutinize these laws—what is kosher and what is not—in the still, vegetative, animate, and human, how we should perform them and at what level. The word Kashrut refers to the word Kosher (“permitted,” “proper,” “lawful”), to the readiness for bestowal. A kosher person has corrected him or herself in all the desires to bestowal and love of others, at least on a certain level. The measure of the desire is the sum of all the desires in us at the levels of still, vegetative, and animate. The more the desire mingles with emotion, reason, understanding, connection with people, and with the upper force, the more we correct it. The laws of Kashrut tell us how to sanctity, how to bring each desire to correction and use it to bestow. The Torah tells us through examples from our world, like using the desire for food, which actually refers to man’s correction. We are bound to fail. It is like a child who cannot understand how a new toy works until he breaks it. He does not even understand that he broke it, or how, if at all, is it possible to fix it. As long as the child does not fully comprehend the making of the toy—how it was made, and what is the role of each part and wheel—the child will not become attached to it. Similarly, we must comprehend the foundations of creation, touch our most basic, egoistic desires, as it is written, “There is not a righteous man on earth who does good and did not sin” (Ecclesiastes, 7:20). We must experience all the sins, fail, and correct them. There is no other way. We must recognize all the evil in us, as the Creator says, “I have created the evil inclination.” Man is the one who must discover where our evil inclination resides. When we discover it, we are considered “wicked,” “transgressors.” We recognize the evil and we regret it. However, we do not regret the recognition of the evil within us because this is how we were made. Rather, we regret that our inclination is not to bestow, but to receive for ourselves. We demand the correcting force, and receive from the above the light that reforms, thus shifting from using each desire egoistically, looking for self-gratification, to the seeking the benefit of others. This is how we correct ourselves. The general recognition of the evil inclination occurs by the breaking of the vessels in the upper worlds. This is our root, from which this world was created. It was prepared in the upper roots, the upper system. It is embedded in the foundation of the nation, in the acts of Nadav and Avihu, as mentioned in this portion. We have to discover it in us in this world. Nadav and Avihu had to go through this process, and by so doing they did a great thing. It may seem to us as transgression or ruin, but in it we discover the foundation of “I have created the evil inclination” and correct it. Nadav and Avihu wanted to reach the end of correction instantaneously. When a person does so, he or she discovers the will to receive in order to receive, the evil inclination, Sitra Achra, Klipa (shell/peel), in its true, and worst form. This is what they did; they drew such a powerful light on themselves that they could not resist it and receive in order to bestow, so they received it in order to receive and therefore died. A person who advances on the degrees does so, too. In us, too, are forces called Nadav and Avihu, in addition to the forces of Aaron and Moses. “Man is a small world,” and all that is told in the Torah exists in each and every one of us. We make the same transgressions and correct them after some time. This is how we become aware of the real evil inclination, the stony heart, which cannot be touched. This is how we learn to correct the desires that can be corrected, and the right order of correction. The laws of Kashrut at the end of the portion stem from all those scrutinies we make. They explain to us how we can correct, and in which way we can bring the incense. That is, how to bring the desires that are properly mingled—the forces of bestowal and reception within us—so they correct one another. This is what the portion, Shmini (On the Eighth Day) deals with. It is called so because Malchut that ascends to Yesod is the eighth Malchut, and we must know how to correct it. It is called “Eighth” after the basic correction, to distinguish between the parts of Malchut that cannot be corrected and those that can be, and to know how we can draw the forces that will correct. We scrutinize all that on our spiritual path, in a correction called Shmini. The number 7 appears many times in this portion. Is there a special meaning to it? It is written that there are six days of work and the seventh is the Sabbath. The six days are Hesed, Gevura, Tifferet, Netzah, Hod, and Yesod. Days are degrees by which we can correct our desires. The seventh day is Malchut that is corrected by itself by what we have done during the six degrees, and by drawing the lights. In fact, all corrections are made on the seventh day. The Sabbath is actually not a day of rest. It is a state where it is no longer possible to scrutinize and arrange anything. Instead, “One who labored on the Sabbath Eve shall eat on the Sabbath.” Only what we do during the six days enters Malchut and is corrected in Malchut, in our Yesod (also “foundation”), in our substance, our meaning desires. The eighth is the reception of the quality of Aaron, quality of Bina, as it is written, “Sons of Bina, eight days.” Malchut connects to Bina, from whom we draw the correcting force on the eighth day. The upper system is called Zeir Anpin, or HaKadosh Baruch Hu (The Holy One Blessed Be He). It is the system that corrects us, the clothing Malchut, which ties to the upper system. In other words, our soul connects to the Creator. The soul is also called the “Assembly of Israel” because it assembles all the souls that desire correction. This is how we come to the eighth. Here we must be careful when we encounter situations such as with Nadav and Avihu, but we will still have to experience them. As was already mentioned, “There is not a righteous man on earth who does good and did not sin” (Ecclesiastes, 7:20). This means that we will encounter many more scrutinies on our way, following our roots, and following what had happened to our forefathers. After all the corrections and exiles we have been through, we arrive at the disclosure and know how to continue. Additionally, we will have good instructions from the wisdom of Kabbalah, so when we face demanding scrutinies we will go through them quickly and continue. Regarding the example of Nadav and Avihu, we always want our children not to make mistakes, but this shows us that mistakes are mandatory? Without being aware of it we constantly lead our children to mistakes. And not only children; even university students about to become PhDs learn by being presented with problems. The learning process itself actually involves solving problems. We present the children with problems and want them to play and resolve it. Alternatively, we give them something to assemble or give them exercises in math, physics, or chemistry. We constantly challenge them with problems. When our children grow and become youths or young adults, we still worry that they might make mistakes. How do we raise children that will not act on their intense desires, as did Nadav and Avihu, who were burned for it? Children learn what to do, how to do it—and if they should do it at all—only by trial and error. Similarly, we have to try and err. We have to discover the shattering, the crisis, our nature, or we will not know how to correct it. This is why we were given the Torah, whose light shines for us and clarifies matters. There is light for the scrutiny of the Kelim (vessels), and there is light for the correction of the Kelim. If we know how to use our Kelim (desires) correctly, we will go through the corrections quickly and pleasantly. If each time we encounter a corruption we will also know that we can fix it, and specifically this way discover another portion of the spiritual world, our eternity, perfection, there is no doubt we will be happy by the appearance of that corruption. In relation to education, when we see our children make mistakes and correct themselves, should we view it as something good? Yes. There are customs where we act joyfully (even on the Day of Atonement [Yom Kippur]), as opposed to the sadness in other customs. The differences stem from misunderstanding what we are discovering. In truth, there is something to each of the expressions of the customs. In each revelation of evil there must be joy, too, since we have the means to correct it and achieve contentment. It is impossible to feel good without discovering and correcting the bad. It is written that everyone will know the difference between the rules of Tuma’a (impurity) and Tahara (purity), and that at the time of the First Temple, every child from six years old knew those laws. What does it mean? This does not refer to children in the physical sense of the word, although that was the prevailing type of education then and children did grow with understanding, sensation, and perception of the upper force. They received upbringing that brought them to bestowal and opening of the eyes. Besides this world, which they saw through their five physical senses, they were assisted in developing a sixth sense, called Neshama (soul). With that sense they experienced the upper force and therefore knew what was good and what was bad. They could distinguish between them and thus grow. Everything depends on the environment. The environment educated children toward corrections, and each child whose ego (will to receive) grew received the appropriate education. Education is a system of correction through the environment, of explanation and support, as our desires grow. Education means teaching children that their desires are constantly growing and should be used in order to bestow, for love. Can such education be established today, as well? It will happen anyway because nature is obliging us to do it. We are heading toward a state where we will have to instill this type of education throughout the world, not just for us, but for the entire nation and the entire world. We need to be “a light for the nations” (Isaiah, 42:6), and pass on the method, “for My house shall be called ‘a house of prayer’ for all the nations” (Isaiah, 56:7) so they will all be as one bundle. Today we are in the last exile, preceding the complete redemption. Therefore, we must first bring this education to the people of Israel, and subsequently to the rest of the world. We are in advanced stages on this path. The crisis we are experiencing, the helplessness in education, and the collapse of the family institution were all intended to open our eyes to big changes. Does that mean that the crisis was meant to make us ask for a solution on a higher level? Yes. The solution already exists, and it is simple. We must understand that there is no other choice, that we have an easy and effective means to obtain bounty and happiness, especially with our children. Otherwise, what kind of world are we leaving for our children? We know that days and occasions mentioned in the Torah symbolize internal stages; what is the day of the inauguration of the tabernacle? Once a person has sorted all of one’s Kelim in mind and heart, meaning in one’s desires, thoughts, and intentions, that person can work with these Kelim in full power. This is called the “inauguration of the tabernacle.” One brings them as offerings when they are scrutinized. The offerings are all the desires that a person can turn from aiming to receive, from egoistic (evil inclination), to aiming to bestow, to the form of bestowal and love. This is the correction. By correcting more and more of one’s desires to bestowal and love, we draw closer to the Creator. The word Korban (sacrifice/offering) comes from the word Karov (near/close), and Makriv (bringing near/offering/sacrificing). This is man’s primary work. So the inauguration of the tabernacle means that one has prepared the Kelim with which one can begin to work. Does being in the light, in the day, refer to a state that is opposite from the night? It is written (Psalms, 36:10), “By Your light we shall see light.” Once we have corrected ourselves in the degree of desiring mercy—bestowing in order to bestow, the degree of Aaron—we correct our desires that are not in reception in order to bestow. We move from constantly wanting to receive for ourselves in all our desires to a state where what is happening is clear to us and we neutralize those desires into a point where we do not want to use them for our own sake, since that would literally destroy and “burn” our soul. Preparing ourselves, this is the tabernacle. Henceforth we begin to correct these desires in order to bestow. “You shall not go outside the doorway of the tent of meeting for seven days, until the day that the period of your ordination is fulfilled; for he will ordain you through seven days” (Leviticus, 8:33). Babylonian Talmud, Masechet Kidushin, 30b. Jerusalem Talmud, Seder Nashim, Masechet Nedarim, Chapter 9, p 30b. Midrash Tanchuma, Pekudei, item 3. “Six days shall work be done, but on the seventh day there is a sabbath of complete rest, a holy convocation. You shall not do any work; it is a sabbath to the Lord in all your dwellings” (Leviticus, 23:3). 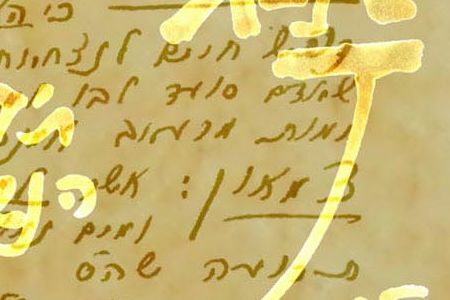 Babylonian Talmud, Masechet Avodah Zarah, p 3a. As sung in the Hanukah song, Maoz Tzur.